I grew up in New York City--Manhattan, uptown, near Columbia University. Sometimes into our urban space, aliens would arrive. Their main distinction to me and the other little kids on my block was twofold: 1) they drove big cars; 2) they provided excellent street theater when parallel parking. These aliens (or "college parents") were harmless. They smiled at people, held doors, we sort of liked them. They'd say "New York is a nice place to visit, but we wouldn't want to live here." Our native drivers did it different--they could and did cram their cars into very small spaces with one hand on the wheel, a casual backwards glance, while maybe eating a sandwich, or having a shouting match with the guy they'd just jumped to claim the space. The aliens lost in comparison. Our attitude was "New York is OK to live in, but we wouldn't want to have to be visitors--"
Visiting the land of two-color knitting is like that. Dabbling at two color knitting is like trying to parallel park if you don't have a system--lurch forward, scootch backwards, drop one color to knit a few stitches with the next color, then drop again. Do you cut the wheel this way or that? Should the yarns should be twisted together? Do you line up with the bumper or the steering wheel? Should the new yarn be taken over or under the old yarn? Without a system, the whole thing can turn into a nightmare. So--what's the difference between a driver carefully maneuvering into a space with assistance of a spouse at curbside and the driver blithely cruising backwards with one hand on the wheel and one eye on the mirror? It is nothing but practice, practice, and more practice until it turns into a system. It's no secret how to parallel park--it's laid out right there on page 43 of the Driver's License Handbook. But, until you do it a bunch of times, until you reduce it to a step-by-step procedure, you won't get it. Two-color knitting (heck--all knitting), like parallel parking, well, you have to practice if you want to slide into the spot on first try. Ahem--just a minute while I climb down off this soapbox here. A classic method of two-color knitting is the "two-fisted" approach popularized by Elizabeth Zimmerman. The idea is to knit one color off the left hand (continental knitting) and the other color off the right hand (English knitting). Keeping the yarns on separate hands means the yarns are kept apart, and so have less tendency to tangle. This is incredibly awkward at first-- the needles won't cooperate, and you'll tear your hair. But, if you persevere, you will succeed. *BEFORE YOU START your two color project--train your other hand in the unfamiliar technique. There are instructions for English and continental knitting here and here. Practice on something small, flat and gaugeless--a potholder?--where tension is immaterial. As per the next point, there is no need to purl. Make this object in garter stitch--knit every row. *WORK the two-color project WITH CIRCULAR NEEDLES around and around on the face of a large-ish TUBE--IMHO, a hat (about 20") would a good size for a first project. If you try color knitting back-and-forth, you're going to have to purl in two colors on every other row. This is not impossible, but it is more difficult that knitting in 2 colors--so leave 2-color purling until you've mastered the tension thing. If you try 2-color knitting on a small tube with dpn's, you'll not only have to watch the tension issue between your own two hands, you'll also have the additional issue of carrying floats across a right angle bend where the dpn's meet. A float will want to cut the shortest line--straight across this corner, making it much shorter than a float stretched out flat. A too-short float = puckers. Bottom line: leave the two-color socks until you have mastered float tension on a flattish piece of knitting. *DON'T CHANGE HANDS--keep the same colors in the same hands. Your hands are going to tension the yarn differently, so being consistent about which hand holds which color will make the finished product nicer. Consistency also makes it possible to analyze your work--if one color is always looser, you'll know which hand ought to be knitting tighter. If you switch colors randomly, you'll really have no idea how to improve. *USE WHICHEVER METHOD YOU'RE BETTER AT (continental or English) for whichever color there is the most of--this will give you the best overall tension. Use the unfamiliar hand to work the contrasting yarn. It is for this reason that the first post in this series recommended choosing a beginning pattern with one clearly dominant main color, and only a relatively small amount of the contrasting color. To explain further: if most of the pattern is made of the main color, and that color is laid down the way you usually knit, you'll have a better chance of getting a good two-color result right away. If you've chosen your color pattern to keep the number of contrasting color stitches to a minimum, then even if your unfamiliar hand lays down the contrasting color with poor tension control, there won't be that much contrasting color to plague you. 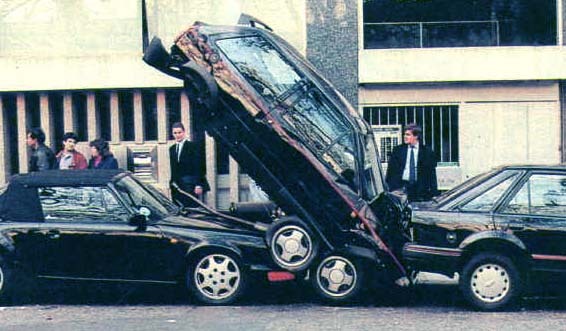 As stated previously, if you have to err, err on the side of TOO LOOSE. Then, if you have to, you can always go back and tighten those relatively few contrast color stitches, float by float and still obtain a wearable garment. This is part 2 of a five-part series on color knitting. Taming long floats via the STUART method for color-knitting. --Good knitting, TK You have been reading TECHknitting on: Two-color knitting, with one color in each hand. (Stranded knitting). 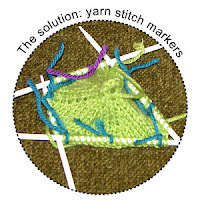 So far on this blog, we started with the idea there are only two stitches in all of knittingdom --knitting and purling. Next, we alternated these two stitches to create different textured fabrics: stockinette fabric, reverse stockinette fabric and garter stitch. Now, we're going in a different direction. Using only plain, smooth stockinette, we're going after two (or more) color knitting. Color knitting makes possible the children holding hands, the contrasting bands on hats, the beautiful Scandinavian designs, the spirals, the squares, the diamonds. All of these designs could be made in texture patterns yes, but color adds an undeniable dimension. This post, the first in a series about color knitting, lays out background. The second post covers the classic "one color in each hand" method popularized by Elizabeth Zimmerman. 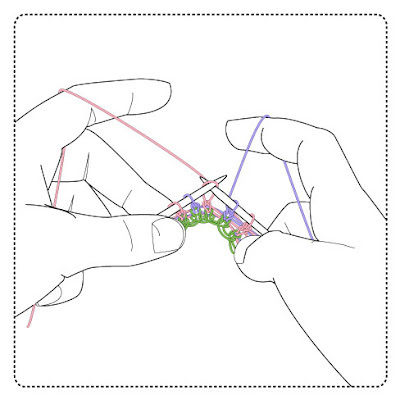 Part three shows the trick of two color knitting with two-colors-in-one-hand, then three-color knitting (two colors in one hand, one in the other). Parts four and five show two different tricks for working only one color at a time, yet still getting multi-color effects. A 2016 addition to this series shows how to strand super-long floats via the STUART method. First project--For beginning color knitters, a swell first project would involve no purling because two-color knitting is far easier than two-color purling. Also good to avoid would be a lot of shaping. Good garments to start on might be a circular-knit muffler scarf or a Norwegian- style steeked sweater. Another good choice would be a raglan-sleeve sweater made with the yoke all-in-one-piece, either top-down, or bottom-up. Raglans with all-in-one-piece yokes are shown in the illustrations of color placement, below. If you use these garment shapes, you'll be learning to color-knit, around and around on a tube, which is the easiest way. 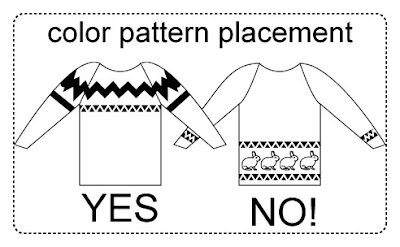 Pattern placement--"all-over" OR on the chest and shoulders--Color knitting is heavier than most kinds of one-color knitting. 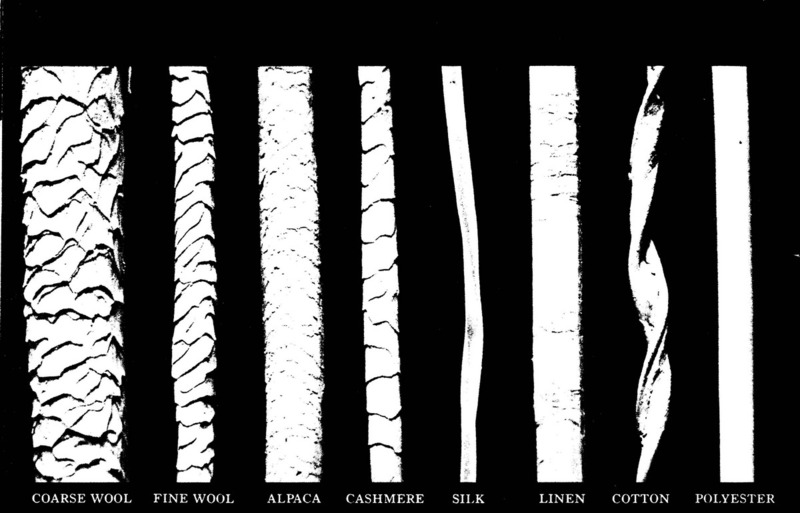 The yarn not on the face of the fabric is generally carried behind, resulting in a thicker, doubled fabric. A garment with all-over color-knit patterns is going to feel balanced to wear--there will be the same weight of fabric throughout the sweater. 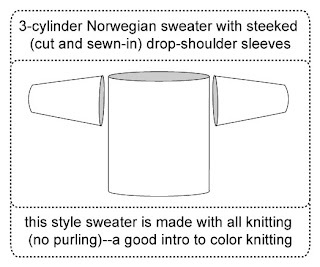 A sweater pattern which has the color pattern only on the chest and shoulders will be OK to wear too--the sweater won't be balanced, but the heavier fabric will be centered on the body parts best able to benefit--the chest and shoulders will be kept warmer by the doubled fabric. In addition, the idealized image of body type for men and women emphasizes a heavier bust or chest, and a thinner waist and hips, so doubled fabric over the chest or bust and the shoulders help with appearances, also. Harder to justify are designs which feature color knitting over the hips and wrists, and nowhere else. These sweaters tend to feel unbalanced. The wrist design, a "bracelet" of doubled fabric, can get annoying as the day goes on. The lower design concentrates bulk where many people would prefer to avoid it--few body types are flattered by a thick roll of doubled fabric around the hips. A short note about hats--hats with color bands and single color tops have a satisfying thickness around the ears, which need to stay warm, but are thinner in the single color fabric over the crown. If these are knit in thin yarn, the crown will be thin enough to let excess body heat rise and escape. Bottom line: a color-band hat with a single color crown knit in thin yarn works especially well for activewear like ski hats. Floats--at least when learning, choose a color pattern which features short "floats." Carrying a yarn behind the fabric face for more than about 5 stitches is courting tension trouble. Color-knitting traditions (Scandinavian, Latvian, Turkish, Shetland Islands) rarely feature any float longer than 5-6 stitches, most floats are shorter, while some traditions call for constructing multi-colored knitting with no floats at all (Scottish argyle). 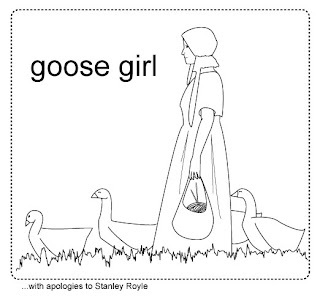 Color knitting originated with goatherds knitting socks on rocky hillsides, fishwives waiting for the boats to come in, young girls watching the geese, sailors at sea, mothers keeping children from the open fire. If all these industrious, clever knitters from different traditions have established that floats should be kept short, there's probably a good reason. Consider avoiding that pattern with the bunnies and L-O-N-G floats (but if you just have to have long floats, I have a trick for those, too, called STUART). 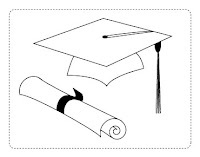 * one dominant color, called the main color (mc), and one contrast color (cc). Starting off color knitting with more than two colors is biting off more than you can maybe chew. *the proportion of mc to cc is best when the main color unquestionably predominates. Despite the predominance of the main color, however, the pattern should avoid isolated single cc stitches: isolated single cc stitches on the fabric surface don't have a lot of "oomph"--they lack the grabbing power necessary to stabilize all that yarn floating behind. *A row or a couple of rows of plain knitting either in or between in each pattern repeat. This allows the fabric an area where the tension is less likely to be off-kilter--a "rest break." It also makes the fabric less dense (easier to knit) than having every single row in two-color pattern--you will see that the floats sag into the plain rows, so these aren't really noticeably thinner than the rest of the garment. Type of yarn--For your first project, choose wool--old fashioned sheep's wool, preferably as rustic as you can stand to work with. Sheep's wool magnified is disgustingly organic--all scales and hooks and wooly hairs. But in color knitting, these organic properties are to your advantage--the projections entangle the floats and help control the fabric. Non-sheep wools, like alpaca and cashmere have some scales, but not nearly as many (which is why they're so soft...) and "slippery" yarns (acrylics, cottons, silks, bamboo, superwash wools, linen) lack the scales, hooks and hairs to hold the different colored yarns together--the result for a beginning project will be disappointment. Float tension: Getting the tension correct in color work is one of the toughest tricks in all of knitting, no joke. You are going to start off making messes, so resolve to err in the direction of too loose, rather than too tight. A new knitter at my LYS was making a red-and-white baby cap destined to never to fit any human born--it would have been too tight for a baby monkey. The floats puckered the fabric so the pattern could hardly be seen. A too-loose cap could always have been tightened up (there will be more about this when we get to long floats) but that too-tight tragedy on the needles was destined to break everyone's heart--all that misspent hopeful energy, so sad. The trick is, the floats should be long enough so that the fabric does not pucker when stretched. Therefore, spread your stitches out along the needle BEFORE you draw the float yarn over them to knit the next colored stitch. In other words, don't keep your stitches all scrunched up. If you do, your float will be shorter than the width of the fabric. Then, once the scrunched-up stitches spread out naturally or stretch when wearing, any floats originally created over scrunched-up stitches will be too short to stretch along, and the fabric will pucker. If you find that stretching the stitches along the needle still isn't creating a long-enough float, the next trick is to put a finger or two in the way, and draw the float yarn over the stretch AND the finger(s). However, floats so loose that they never come under tension even when the garment is worn are floats which have a hard time glomming on to the back of the fabric, even if you are knitting in the hairiest sheeps-wool going. Too-loose floats will catch in buttons and fingers and toes. Somewhere around about the tail end of the second project, you'll find the float tension you are aiming for. 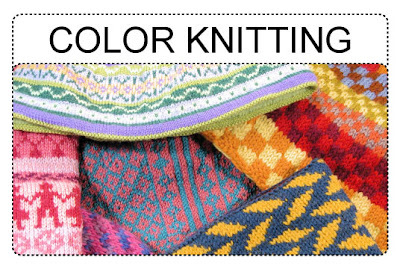 You have been reading TECHknitting on: the basics of color knitting--how to knit with two or more colors. 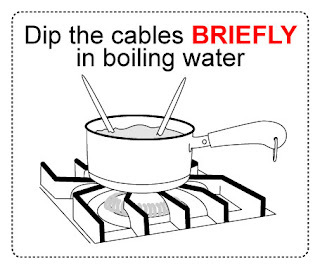 Dip the cable into boiling water for a few seconds. When you dip, include that part of the needles where the cable attaches. A WARNING--Deborah, a reader and a blogger, states that when she tried this with a *bamboo*-tipped circular, the steam removed the finish and made the grain stand out rough.
" I recently got some very short [needles] ... but I haven't tried them yet. Do you have any advice on the length of the dpns? I thought these short ones might be more comfortable on a thin sock." "De gustibus non est disputandum," "in matters of taste, there is no right and wrong." If you like them, and they work for you, go for it. BUT, I will say that the type of work being done doesn't influence the length of the needle as much as the interaction of your HAND and the needle--a very short dpn might be too short to get your hand on properly. If you look back at the illustrations in this blog, you'll see that every hand grasping a needle presses the needle between some fingers and the palm of the hand, or between the fingers and the heel of the thumb. In no case is any needle held in the fingers alone. Unfortunately, a very short needle might be too short to hold any way EXCEPT in the fingers alone--uncomfortable. Long answer short: Make sure the dpn's are at least long enough to get a good grip on. "I wonder if you will suggest my own "unvented" solution. Those first few [rounds of dpn knitting] can be maddening. I'd recommend finding an experienced knitter to 'start' your initial experiments with double points. That way you can perfect your technique first and then move on to attempting those slippery first rows when you are more comfortable with the process." Another advantage: Obviously, I (of all people) think a lot can be accomplished by sitting quietly and looking at illustrated instructions, BUT adding that real-life component--watching someone else do it--is invaluable. Dear Readers: If you are feeling bold, and if you have anything to say or ask about dpn's, consider speaking out in the comments. If it's a question to you, it's probably a question to others.... If it is a neat trick which worked for you, others will be glad to know of it, too. Ladders happen when the tension of knitted fabric consistently changes between the same two column of stitches. 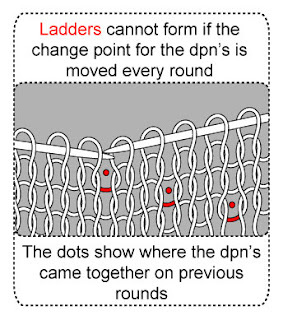 The usual place for ladders is where dpn's come together, although this same problem can arise between the front and back stitch sets in Magic loop knitting as well. Another popular place for ladders is along a line where stitch markers are inserted. PROBLEM: The tension change issue is more dramatic, and the ladders more obvious, when you are working on 4 needles (3 holding needles and a fourth working needle). This is because the rigid triangle formed by the 3 "holding needles," and the steep angle of the work make it harder to knit the first and last few stitches. Anytime you have a few stitches which are harder to work than their neighbors, you get a tension-change (and maybe a tension headache?). SOLUTION: Double pointed work is easier on 5 needles (4 holding needles and a fifth working needle). The shallower angle of work possible with 4 holding needles means it isn't as hard to knit the first and last few stitches. In other words, the first and last few stitches aren't notably any harder to knit than the middle stitches, so there is less reason for the tension to change, and fewer excuses for ladders to form. PROBLEM: When you first learn to knit on dpn's, it's to hard make ladders go away by changing your tension. Sometimes a ladder occurs because the tension at the change point is too LOOSE, sometimes because the tension is too TIGHT. Trying to compensate by pulling tighter, or knitting looser can make your ladders go from one kind to another without ever solving the problem -- frustrating! SOLUTION: Practice makes perfect. At some point, maybe on your eighth (or twentieth) pair of socks, you'll look down and surprise!--your hands will be knitting along without creating ladders. Because ladders occur where tension changes are stacked up in the same column, it is possible to avoid ladders by un-stacking the tension changes. Stated otherwise, if on every round, you move the point at which the tension changes -- the change point for the dpn's-- there simply cannot be any ladders. There are two ways of shifting the change point: forward (leftward) switching and backwards (rightward) switching. The illustration shows forward switching which was created by carrying two stitches forward every round. Backwards switching would look very similar, but the dots would recede rightward on each new row, instead of proceeding leftwards, as shown. Instructions for both kinds of switching (carrying) are below. 2. Leave the right needle (green) currently in your right hand just where it is--this now becomes the old right working needle. 4. With your free left hand, grasp the next dpn (holder-needle) to the left--this becomes the new left working needle (purple). 7. 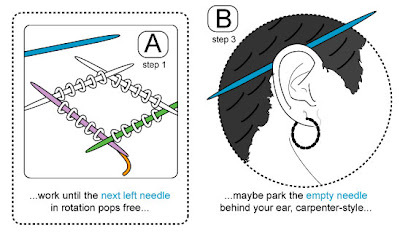 With your free right hand, take the empty needle from behind your ear, or from the table where you parked it. This needle now becomes the new right working needle. Using the new right working needle, work all the stitches off the left working needle, until the left needle is popped loose. (Illustration D). As you "carry stitches forward," you've not only eliminated all possibility of ladders, but you've gained other advantages, too. By freeing your left and right hands at different times, you maintain one hand on the work at all times. This maintains a better tension, is quicker than re-arranging both hands on two new needles at every needle change, and makes it easier to get back into rhythm at each switch--only one hand has to get re-organized at a time. 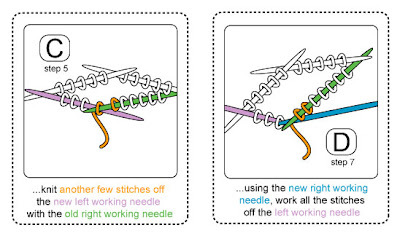 Backwards switching is the same idea as forwards switching, but instead of knitting additional stitches onto a needle, several already-knitted stitches are slipped backwards, onto an empty needle. The empty needle thus becomes the new right working needle, and the direction of slip moves the point where the dpn's come together rightwards by several stitches. 1. 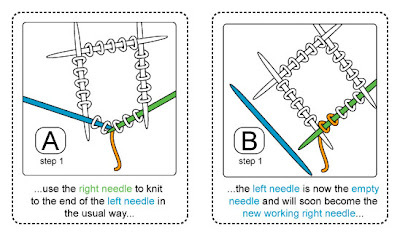 Use the right needle (green) to knit to the end of the left needle (blue) in the usual way. Illustration A.) The left needle is the empty needle and will soon become the new right working needle. (Illustration B.) Retain the empty needle in your left hand. 2. The right needle is finished knitting and has now become a right holder needle, holding all the stitches you just finished knitting. Retain this holder needle in your right hand. 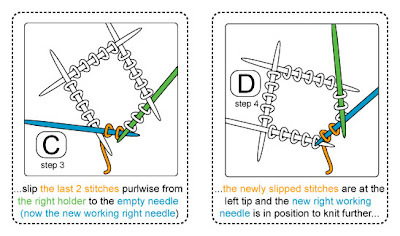 3.Holding the empty needle in your left hand, and the right holder needle in your right hand, use both hands together to slip the last 2 (or 3, or 4) stitches (orange) you knit PURLWISE (open--not twisted) from the right holder needle onto the left tip of the empty needle. (Illustration C.) By this act, the empty needle has become the new working right needle. 5. 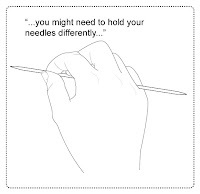 With your free left hand, grasp the next dpn (holder-needle) to the left--this becomes the new left working needle. Sometimes you might find that progressive switching, either forward or backwards, would mess up the needle placement by interfering with shaping--such as at sock toes. 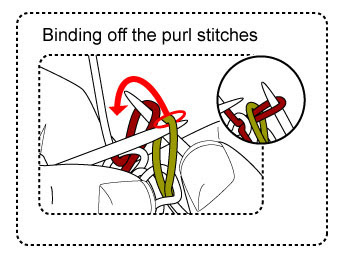 In this illustration, the shaping stitches (in red circles) cannot be switched or the shaping will be hard to keep track of. But what about the center stitches of the toe where 2 dpn's come together on a smooth piece of non-shaped fabric? 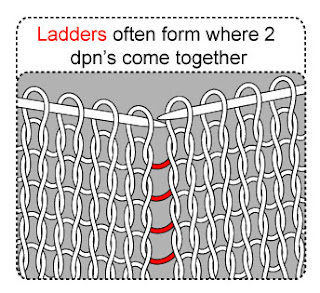 (In this illustration, the center stitches are those inside the bracket.) It is not uncommon to see a big ladder running right down these toe center stitches. In a case like this, you can use combination forwards and backwards switching on the center stitches. Combination switching lets you change where the dpn's come together at one end of the needles, but keeps the other end of the needles in the same place--so you don't mess up your shaping. Here's how: Where the dpn's for the toe centers (front and back) come together, carry 2 stitches forward between these two dpn's for a few rounds, then on the next several rounds, carry 2 stitches backwards. 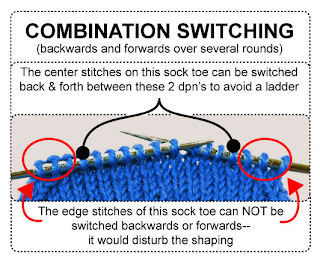 If you keep alternating between forward and backwards switching on the center stitches you'll avoid ladders on the toe centers, but you won't disturb the shaping at the toe edges. PROBLEM: A ladder develops where stitch markers are inserted. SOLUTION: Use yarn scraps for stitch markers. Do not allow the marker yarn to become entangled in the fabric--keep it free. The tail between stitches does not have to stretch as far around a scrap of yarn as around a metal or plastic marker, so the tension does not change where the marker lies. This is rather a sad solution, because there are many creative, beautiful jewel-like stitch markers on the market today, and it's more fun to use these pretty markers than to have your work bristling with odd scraps of yarn. However, perhaps you will consider the absence of ladders a consolation. 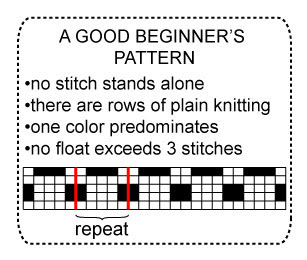 You have been reading TECHknitting on: Avoiding ladders on dpn's (double pointed needles). Double pointed needles are one of those rites of passage like riding a bike or high school graduation. On one side of the divide, you know you still have something to prove, on the other side of the divide, you've arrived and can't remember what the fuss was about. Dpn's are like that: before you learn, you can't imagine how it works, after you learn, you can't remember what you were worried about. Remembering the process from this side of the divide, figuring out dpn's seemed most like learning to carry a big, empty box. Hard to get a hold of, awkward to carry, but not really difficult once you've got a grip. Of course, "getting a grip" will be easier (literally and figuratively) if you use the easiest materials, arrange the needles the easiest way, hold the needles nicely and use tricks to avoid problem points. 1. Four needles or five? Sometimes dpn's come in sets of 4, sometimes, in sets of 5. For the time being, let's ignore just how we are going to make 4 or 5 needles stay in the work at the same time--we'll circle back to that later. 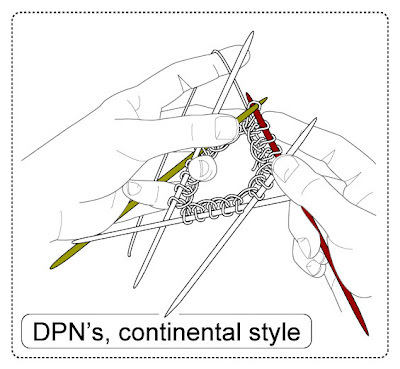 The fact is, to operate dpn's, you only knit with two needles at a time, just like any other kind of knitting. The others are "holder needles." Until the time comes to knit with each in its turn, these just hold the stitches "around the back" as the cables on a circular needle do. If your dpn's came in a set of 4, the expectation is that, at rest, your tube will be on a triangle of 3 needles; the fourth needle will be the working needle. As you work with the fourth needle, your triangle grows into an irregular square, and then back again into a triangle as you get to the end of the working needle. 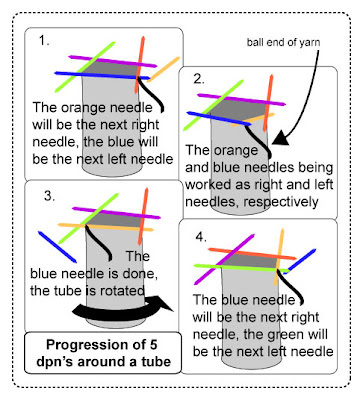 If your dpn's came in a set of 5, the expectation is that, at rest, your tube will be on a square of needles; the fifth needle will be the working needle. As you work with the fifth needle, your square will grow into an irregular pentagon, and then back into a square as you get to the end of your working needle. This variation is confusing: sometimes 4 needles, sometimes 5. You may wonder which way is better. The answer is, "buy needles in sets of 5," and the "why" behind it lies in your past--in high school shop class, or maybe geometry. In shop class, your teacher probably yammered on and on about how wonderful triangles are--how easy it is to make them stable. See, if you nail down any one point on a triangle, the whole thing is frozen, it can't "rack" or twist into another shape. Squares aren't as rigid--even with one point nailed down, you can easily "rack" the square into a diamond shape. That's why squares are "triangulated"--inside your walls, the square stud walls are often divided into triangles, and bridges often feature trusses made of squares braced into triangles: the triangulation prevents the otherwise wobbly squares from racking and collapsing. The geometry version of all this is that once you nail down any one angle of a triangle, the other two angles must rigidly follow. The result of this trip down memory lane? A triangle is a rigid shape, but a square isn't. Now, rigidity IS a wonderful thing for building bridges or putting up walls. But for knitting, it's NOT such a wonderful thing--knitting is nicer when it is flexible. If you have your tube on 4 needles, you can rack your square into a fairly flat shape, a sort of a diamond, before you start knitting around with your fifth needle. By contrast, if you have your tube on three needles, you're working with a rigid shape--you really can't tug a tube on three needles flat before you start knitting around with your fourth needle. 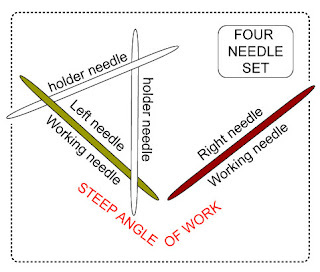 Another way of saying the same thing is that with the flattened-out diamond shape your working needles come together in a shallower angle, whereas with a triangle, you have a steeper angle of work where the working needles come together. The shallower your angle of work, the easier the knitting will be (that's also why back-and-forth knitting is easier on a long circular needle than on a short circular needle). Being able to pull your work into a diamond shape means your angle of work is shallower, and shallower=easier to knit. Of course, nothing is ever simple, and the downside of 5 needles rather than 4 is more needles to control. Perhaps worse--you also have more potential spots for ladders. Nevertheless, when you're first beginning, the upside of more needles far outweighs the downside. (Not to mention: the next post in this series is about avoiding ladders!) Bottom line: buy and use dpn's in sets of 5, not 4. Superwash wool is durable and washable. Steel needles don't break. Lady Logic might dictate knitting socks out of durable yarn on unbreakable needles, but she never went scrambling around the floor after slippery steel needles, or tore her hair out trying to hook all 5 plies of slippery superwash wool. So, for your first pair of socks, ignore Lady Logic. She doesn't know what she's talking about. Yes, superwash is much more durable, but plain old wool is much more "sticky." The plies stay together, the fuzz holds onto the needles and it's much easier to work with. Yes, bamboo needles are harder to push through the fabric than shiny steel or nickel plated needles, but in sock knitting you WANT needles that stick to the fabric. Yes, bamboos break, but by the time they do, you'll be a pro and can pick up a set of (5) steel needles that'll last a lifetime. Bottom line: for a greater chance at success when first starting, use plain old wool, and bamboo needles. Much seamless tube knitting on dpn's is done on very thin yarn--such as socks or lace. Many knitters come to dpn's never having knitted on yarn that thin before. But knitting thin yarn requires different skills than knitting thick yarn. First, and most obviously, thin yarn requires a lot more patience--it goes slower. But beyond that, a certain nimbleness is required to maintain the tension on thinner needles with thinner yarn. 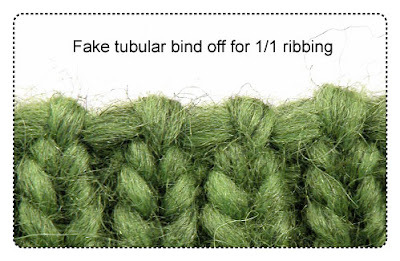 You might need to wrap twice around a finger where you only need to wrap once for thicker yarn. You might need to hold your needles differently. It's not a great idea to try acquiring the skill of thin yarn at the same time as you're trying to acquire the skill of working around lots of dangling needles. Bottom line: Knit something flat out of thin yarn BEFORE you tackle dpn's. I once overheard a salesman in Sears telling the prospective buyer of a radial arm saw "count all ten of your fingers, and know where each one is before you turn on the saw." Luckily, you can't cut your fingers off with dpn's like you can with a radial arm saw, but knowing where your fingers are at all times is still good advice. You have ten of them, and each one can contribute something to holding the needle, tensioning the yarn, doing the knitting. If you look at the last two illustrations of this post, you can see that nearly every finger is doing something, and many fingers are doing two or three things. The point is not to ape the finger placement illustrated, but to work on finger placement which suits you--remembering that each of your ten fingers moves independently. 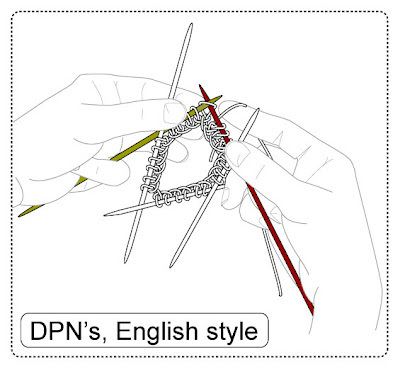 You'll find it easier to knit with dpn's if you arrange the needles as in the illustration above. 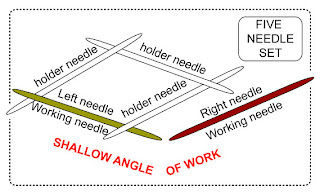 Specifically, the left needle should be arranged OVER the holding needle next to it, and the right needle should be started off UNDER the holding needle next to it. Obviously, it makes no actual difference which way the holding needles lay, but if you follow the "left-over, right-under" rule they'll come out per the illustration all by themselves. If someone could hand you a tube already started, or a center-started garment on the fourth or fifth round, you'd have a much easier time of knitting than if you have to start from the actual cast on stitches. In the case of a tube, you want the casting on to be loose, because that cast-on edge is also the garment edge of whatever you're making--sock, mitten, hat. Yet, small dpn's in loose cast on stitches are the formula for falling needles. In the case of a center-started garment, like a hat or shawl, you begin with very few stitches on your needles, and few stitches don't have the "oomph"to hold in dpn's which are so much longer, proportionally. In my analysis, the best way around this problem is to sit at a table when you're starting a project. Put down a nice loopy towel, and consciously rest the holding needle tips on the rough and catching cloth until you've gotten enough rounds into your knitting for the stitches to hold the dpn's by themselves. IMHO, trying to start a project on dpn's over your lap is a great way to go nuts. As to the actual method of casting on the stitches, follow this link. 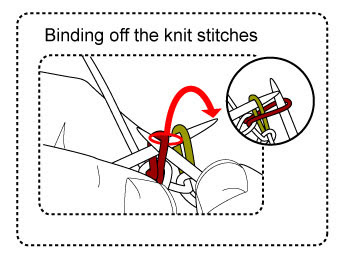 The hard part of operating dpn's isn't doing the actual knitting, because the actual knitting is just like any other knitting--it is done with two needles, a left and a right. As in ordinary knitting, the left needle holds the stitches, and the right needle does the work of drawing new loops through old loops to make new stitches. The hard past of using dpn's is learning to work around the needles you're not using, the holding needles that are just dangling there, in your way. As you can see from the illustrations, you have to figure out where the holding needles can protrude from between your fingers. Yes, it's awkward but it gets less so with every round. 1)--are you puzzled as to why there are irregular numbers of stitches on each needle? Stay tuned for the next post--how to avoid ladders with dpn's. 2) Happy Easter and happy Passover! 3) Many thanks to J. and also to L. for being the hand models.